Ignite the Light is a book written by Vicki Savini, an elementary school teacher disheartened with the state of the educational system in the United States, that wants to make a difference. We expect so much from our kids academically, that emotional intelligence is often overlooked. Savini points out that we are constantly teaching our children through our actions. In order to teach our kids how to thrive, we first have to demonstrate these things in our own lives. I was personally taught as a kid that any feeling but happy was not desired. If I was sad or angry, frustrated or upset in any way, my mom tried to “fix” it so that I would be happy again. She still tells me to put on my best face and to show off my smile. I did learn how to do just that. It’s one of the reasons that I’m great at speaking in front of a crowd. I’ve been sick as a dog and gotten up in front of a group of people to give a talk and when I’m finished people tell me that they never would have known. I can put on a happy face and fake it until I make it. That works if you’re an actor or a speaker, at least some of the time, but what about those other feelings? What happens to that anger and frustration and sadness when it’s covered with a smile? I don’t think that those feelings ever go away, they just build up until they are too big to handle, or transmute into sickness of the body, mind, and spirit. One of the most important lessons we can teach our kids is that ALL feelings are okay. Savini points out that feelings are signals, or flags to what choices we should be making. If something doesn’t feel right, we should listen to that feeling rather than stuffing it down and hoping it goes away. The more we are true to our feelings, the more happy we can feel overall. Of course, as parents, we want our kids to be happy. But sometimes, they also need to be sad or angry or frustrated, or lonely, or tired, or feel left out, or overwhelmed or anxious, or whatever. Our job is not to make them feel happy all the time, it’s to help them to understand their feelings and discover what it means about what the next right action is to take based on those feelings to bring them back to a state of contentment. Savini talks about the importance of responding to life rather than reacting to it, and of coming from a place of love rather than a place of fear. If we are coming from a place of love when trying to understand our child’s feelings, then there is no feeling to be afraid of. Love will enhance good feelings and disperse the bad. Fear will do the opposite. We can choose love over fear. Many of these essentials are things that I’ve been working on already, and so they really resonated with me. After describing each of the essentials, Savini devotes the entire last section of the book to suggesting practical exercises to make them a part of everyday life. As with anything, they will only work if you take time to do the work rather than just reading about it. 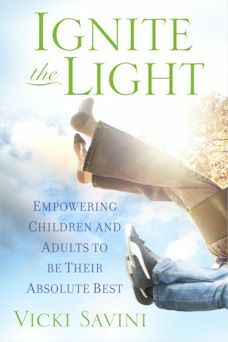 I encourage every parent or teacher to read Ignite the Light by Vicki Savini and watch the world change, one child at a time, beginning with yourself. FTC Disclosure: I received this book for free from Hay House Publishing for this review. The opinion in this review is unbiased and reflects my honest, personal, opinions about the book.